First Class Accommodation on 100 acres of orchards and gardens. Walking distance to the historic village of Richmond in the Coal Valley, 20 minutes from Hobart. Some suites have 4 poster beds and spa baths, some with open log gas fires. Our Clydesdale horse drawn carriage leaves Hatchers for a leisurely tour through our orchard and historic farm , past the oldest Catholic church in Australia , you will cross the nations oldest bridge , then enjoy a stroll through Richmond Village (Please pre book your carriage experience). Situated in the main house, this 30m2 Executive Suite features ornate handmade cornices and ceiling roses, a Four Poster King Size Bed and a double fold out lounge. For your comfort it also has a dining table and chairs, a flat screen TV and DVD player, a Gas Log Fire and a well-appointed 6m2 Kitchenette including a cook top, microwave and refrigerator. Patio doors located at the end of the suite open up onto the farm grounds with your own private outdoor seating area so that you can enjoy the views of the paddocks and the rolling hills behind Richmond. The 6m2 bathroom boasts a 500mm step into a large luxury spa bath featuring an overhead shower. This suite can sleep a maximum of 4 people. Small meeting rooms are available with full facilities. All rooms have Direct Dial Phones. If arriving later than 9.30 pm please ring and make arrangements for late check in. Also pre book your carriage ride before arriving to esnure it is available. Rates are based on 2 people only. 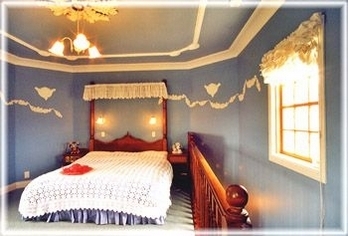 Extra adult charge is $22 per night, extra child charge is $15 per night. Cots can be hired for $5 per night. Please advise us in the Guest Comments section of the Booking Form if you require a cot. Subject to availability. 20 minutes from Hobart airport and 20 minutes from Hobart.